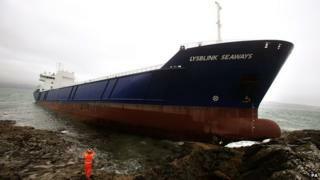 Image caption Bha an Lysblink Seaways a' giùlain luchd pàipeir eadar Béal Feirste agus Nirribhidh nuair a bhuail i ann an cladach Chille Chòmhghain. Chaidh bàta bathair a chaidh air na creagan air cladach Àird nam Murchan tràth madainn Diciadain a chur air bhog le muir-làn. Tha an Lysblink Seaways a-niste air acair faisg air Cille Chòmhghain, far an do bhuail i sa chladach. Bha i a' siubhail eadar Béal Feirste agus Nirribhidh le luchd-pàipeir. Chaidh an soitheach, sa bheil 7,000 tunna de chuideam, a shlaodadh far nan creagan oidhche Ardaoin nuair a bha an làn àrd agus i air bhog a-rithist ro 9:00f. Tha bann-ola fhathast mu thimcheall air an t-soitheach airson smachd a chumail air a' bheagan ola a tha air aodion bhon t-slige. Tha dùil gun dèan dàibhearan a tha ag obair còmhla ris an sgioba-sàbhalaidh Duitseach, rannsachadh air a' bhàta uaireigin Dihaoine, gus dèanamh a-mach dè an ìre de chron a chaidh a dhèanamh oirre.